We’ve been to the Katmandu restaurant before, so we checked the oleo restaurant guide for other Indian restaurants and decided to try La Reina Kunti at Humahuaca 3461, just a couple of blocks from the Abasto shopping mall. La Reina Kunti is in an old building with no sign outside that it’s a restaurant. Stepping inside, the front room has a very nice decor and everything seemed promising. We arrived at 9:15 and almost every table was empty. Then we discovered that reservations are essential and they only had a few tables unreserved. So, we were led by the hostess to a small room in the back. The back room is not nearly as nice as those in front. Still, everything seemed okay. When we looked at the menu we realized that La Reina Kunti isn’t really an Indian restaurant. Of course, Buenos Aires doesn’t really have much, if any, of an Indian community. The blonde hostess was the first sign that things were not as they appeared. More accurately, La Reina Kunti is a vegetarian restaurant with an Indian theme. So, don’t go expecting that it’s an Indian restaurant. Anyway, we enjoyed a good sampling of different dishes and the prices are very affordable. The service was rather slow. We ordered an additional bowl of rice. Eventually, the waitress came by the table and said that the rice would be ready in five minutes. We asked if it would really only be five minutes and she said yes. Twenty minutes later the rice arrived. Well, it is the kind of place that you go and relax, and, despite the slow arrival of the rice, the overall service wasn’t bad. The back room, located next to the toilet which flushes quite loudly, consists of four tables and is evidently where they put people who show up without reservations. One of the tables is a large, low table with a couch and some pillows thrown on the floor. It all looks very cozy. We were seated at an adjoining table when the hostess brought back another couple who sat on the couch. The hostess informed the couple that they would have to share the table if others arrived also without a reservation. Then things started to get interesting as the dinner show started: the couple, in their late twenties, proceeded to spend the next hour making out on the couch while the rest of us at the three other tables tried not to notice. The room is really quite small and everyone seemed a little uncomfortable as the couple made quite a spectacle of themselves. Of course, public displays of affection are quite common in Buenos Aires, couples often make out in parks and on the street. But this was way beyond what I’ve ever seen in a park or on the street. It was more of the dark corner of a nightclub variety smooching, body groping, tongue lashing, loud lip smacking ecstasy. I expected them to break out a condom at any moment. Even a few minutes of that would have not been so unusual but to go on like that in a restaurant for more than hour was just bizarre. Remember that they were told that they would have to share the table. The hostess brought back one couple and showed them the table. The man who had just arrived took one glance at the amorous duo and then looked back at the hostess with a look that seemed to say, “Are you kidding? It’s a joke, right? Am I on one of those hidden camera shows?” Needless to say, that couple didn’t stick around. Later, two women were shown back to table but quickly turned their heads and left when they saw the same sight. Perhaps La Reina Kunti should hire the couple to stage some type of Kama Sutra show to compete with the tango shows around Abasto. It was certainly a unique dining experience. With so many restaurants in the city we will not be back to La Reina Kunti. Yet, if you’re looking for something different and not too expensive then it’s worth trying. When we left just past eleven the restaurant was packed and people were waiting for tables. It also might be a good place for a group of people, four to eight or so, for a special celebration without spending a lot of money. But, even if going only as couple, do make reservations and ask for a table in the front room which is the most stylish part of the restaurant. The middle room is not bad but avoid the back room. Even without the “entertainment” the back room isn’t much more than a hastily decorated storeroom quickly converted into a dining area. Just past noon on Tuesday I wandered up to the center of the city to see what was happening around the city legislature building as the political trial of Buenos Aires mayor Anibal Ibarra over the Cromagnon tragedy reached its conclusion. The crowd turnout was rather small, particularly considering the massive size of many demonstrations in Buenos Aires. There were two clear fractions to yesterday’s gathering and the police did a good job of making sure that the two opposition groups were separated. The pro-Ibarra forces were in front of the Cabildo where Diagonal Sur enters Plaza de Mayo, just in front of the legislature building. 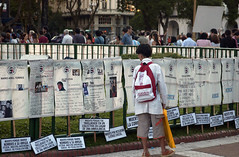 The families of victims from Cromagnon were on Av de Mayo at the pedestrian intersection of calle Peru, which also leads to to legislature building. The arrangement ensured that neither group was visible to the other. Two rows of several dozen policemen blocked off Av de Mayo in front of the plaza just in case the groups decided to approach each other. However, individual pedestrians could easily pass through the police line between the two areas. While I stayed mostly on the shadier Av de Mayo, I found myself going back-and-forth quite a bit between the two groups. About eight minutes before one p.m., when the proceedings were to start, Ibarra arrived in a small motorcade to the cheers of his supporters. Ibarra’s supporters waved a number of signs stating that this vote was a golpe, a coup, of the government. Pictures of Mauricio Macri, Ibarra’s political opponent whom many believe is orchestrating events, were on some of the signs. On the Cromagnon side, most of the people gathered were family and friends of the victims. Most of the parents had gathered in the cafes along Av de Mayo to watch the proceedings on TV. Others crowded around the windows along the street to watch the TV coverage. Occasional passers-by would stop and ask about the vote. Early in the afternoon a group of young people, mostly university students, came marching down – of all places – calle Florida to join the Cromagnon crowd. They were carrying banners of the Workers Party and the Revolutionary Communist Party, as well as FUBA, the student federation from the University of Buenos Aires. Amusingly, at the very same time, a group of Asian tourists walking down Av de Mayo came to a complete standstill when they saw the red communist flags complete with hammer and sickle. The Asians looked perplexingly at each other as they absorbed the situation. Eventually, they decided to turn around and head back in the direction from which they came. I assume that many of the young people were friends of people who died in the Cromagnon fire. Others likely came out of a sense of identity with those who died, most of whom were also young. Others, with their flags of the far-left, likely came out of a sense of youthful idealism. After four hours of waiting, the tenth and deciding vote against Ibarra was cast. The street erupted in applause. 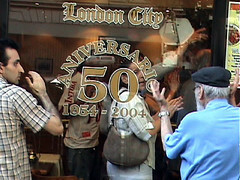 The photo was taken outside of the London City Cafe just moments after the final vote. Families came out of the cafes with tears in their eyes. A woman dropped to her knees in the middle of Av de Mayo. A gray haired man around fifty walked away from the crowd and covered his face to hide his tears. The vote gave the families a brief, fleeting sense of justice, whatever they may be, but there can never be justice in the case of Cromagnon. While parts of the crowd were exuberant in jubilation, it was obvious that the families were thinking more about their loss loved ones rather than Ibarra. Now, they wait for the criminal trials of Omar Chaban, the nightclub owner, and Callejeros, the band that was playing in Cromagnon that night. Late Monday afternoon I walked over to Plaza de Mayo where families of victims from the Cromagnon nightclub fire were starting a vigil. The families had placed posters of the dead around the monument in the center of the plaza. A quarter after six p.m., the families started walking around the Pirámide de Mayo in a manner reminiscent of the Mothers of Plaza de Mayo. Below each poster of the deceased is a small sign. Some say things such as “Dead because of being transported in a bus instead of an ambulance”, “Dead because the ambulances had no oxygen”, “Dead because of the corruption”…. some of the signs are more political with accusations towards specific individuals in the city government. Of course, the center of attention is now Aníbal Ibarra, the suspended mayor of Buenos Aires who is facing impeachment. Tuesday afternoon the city legislature will present their verdict. I’ve written before on the political fallout of the Cromagnon tragedy. Unfortunately, the battle between opposing political forces in the city, as expressed through these proceedings, has overshadowed the safety issues. The politicizing of the event has become a controversial topic and there will never be any agreement about it in this city. A good post, in Spanish, at Agua Fuertes talks about the contradictory nature of the issue.